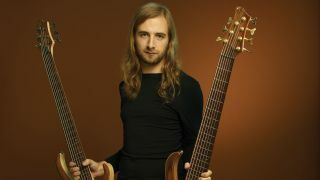 Obscura's Linus Klausenitzer: "People say that all music has been done before, but I totally disagree"
Before I joined Obscura in 2011, I studied at the music college in Regensburg and at the music conservatory in Hamburg. I played in folk, punk and jazz bands to gain experience, but I’ve been a metalhead since I was 14 so it’s no surprise that I ended up in the metal scene. 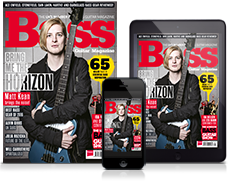 Like my predecessor Jeroen Paul Thesseling, I play extended-range fretless in this band: it’s the sound I like best, although I’ve played all kinds of basses before this. My parents are musicians and they got me into music at a very early age - I played trumpet and piano, and took up the bass when I was 16. I admired Steve Harris of Iron Maiden: he was the guy who brought me to metal, although I know it’s a cliché. In the 80s, bassists like him and Geezer Butler of Black Sabbath had their own identities in their bands, unlike today. I also focused on funk and the rhythmic games you can play in that music: I was into Tower Of Power and Alain Caron. Building bass technique is mostly about practice, of course, but I’ve gained a lot of knowledge simply by listening to different forms of music. I think it’s very important to understand tension in music and how it resolves, which is one reason why we play so fast and aggressively. Metal is the form of music in which you can express yourself most extremely. Also, we want to make music that is different. There are a lot of good musicians around but many of them sound the same, so we sit down and try to go in different directions. We listen to how chord structures evolve, and then we try to use our musical skills in ways that are new. It’s important to find your own character as a musician. Some people say that all music has been done before, but I totally disagree: the next thing I want to try is some flamenco techniques on bass, for example. I play an Ibanez BTB 676 and an Ibanez BTB 7: those basses aren’t available fretless, so they made them for me. I tune a whole step down, the same as our guitarists. My seven-string is the same as a six-string but with a high F: I’m not a big fan of the trend to go deeper and deeper. You lose attack and punch and clarity that way: it makes sense to me to have a wider range of higher notes, especially in the music that I play which has low vocals so the bass doesn’t disturb them if I play high. I also endorse D’Addario strings. I play their roundwounds, which is unusual for a fretless player: you need a high, percussive sound in metal. They don’t destroy the fingerboard, as I’d feared - just a little mark here and there!